Safe-T-Vac™ suction catheter suction catheter kit does not include solution. Cathmark® Neonatal Suction Catheter includes calibration markings facilitating proper tip placement, helping reduce the incidence of pneumothorax in neonate suctioning. Sterile suction catheter kit with chimney valve and two (2) walleted blue nitrile latex-free exam gloves. Maxi-Flo® Suction Catheter features a tip design that improves suctioning efficiency and minimizes trauma to the airway. Touch-Trol™ Suction Catheter features a directional valve that reduces the chance of exposure to aspirated sputum and is color coded for easy French size identification. AM Sure Suction Catheter Kit, Pop-Up Solution Cup, Gloves - AMSINO INT'L INC.
Sterile suction catheter kit includes a graduated catheter, pop-up solution cup and one pair of vinyl gloves. Suction Catheters, Open, Straight Packs - MEDLINE INDUSTRIES INC.
Medline red rubber poly-catheter, packaged in a straight pack. Catheter, Soft Simplastic, Couvelaire Tip, 24 Fr, 16in, 3-way, 30cc Balloon, Single Use, Sterile - TELEFLEX MEDICAL, INC. The Soft Simplastic® catheter is designed for treating patients with clots, debris and mucous. The catheter has a large drainage eye, and walls which resist collapse under aspiration. Features a clear double-lumen tube, three smooth eyes and are highly X-Ray opaque. Venting action provides safe, effective drainage. Suction Catheters, Soft Simplastic, Couvelaire Tip - TELEFLEX MEDICAL, INC. Features a whistle tip and thumb control port for accurate suctioning. Latex-free, sterile, and single-use only. Suction catheter kits include Tri-Flo suction catheter, latex or vinyl exam gloves and pop-up solution basin. The chimney style valve has a large opening on the control vent that minimizes residual suction. Suction Catheter Kit, Dry, Mini Tray, Vinyl Gloves, 14 Fr - MEDLINE INDUSTRIES INC. Smaller mini-trays for easier storage with catheter and gloves and the tray is the cup. Suction Catheter Kit, Open, Cup, Gloves, 12 Fr - MEDLINE INDUSTRIES INC. Contains a catheter, cup, and a pair of high-quality Medline Aloetouch® 3G Stretch Synthetic gloves to help soothe dry hands. 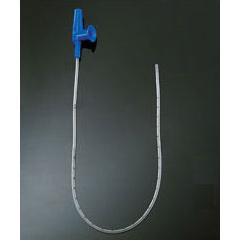 Short suction catheter is a replacement part for V-VAC™ manual suction unit. Suction Catheter Kit, Pop Up Cup, 12 Fr - MEDLINE INDUSTRIES INC. This kit includes sleeved catheter and pop-up cup. DeLee Suction Catheter, Argyle, Mucus Trap, 10 Fr, 20 cc - BOUND TREE MEDICAL, LLC. Argyle™ DeLee Suction Catheter includes mucus trap.